We usually don’t go gaga over pie—no one makes a pie as good as our mom. Except for the pie professionals who bake up a storm for Harry & David’s Heritage Pie Club. These pies are so good, even Mom can’t complain that they’re ready-made. The pies arrive frozen, ready to be baked. 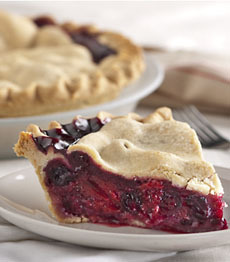 Each month brings a different seasonal fruit in a handsome and delectable crust. The current month’s selection, Apple Cranberry Pie, is simply heavenly. The pies are nine inches in diameter, two pounds of heaven. Pies so good, they’re better than homemade. Photo courtesy Harry & David. Purchase online at HarryAndDavid.com. All memberships begin in December. Find more of our favorite cookie and dessert gifts for Holiday 2010.